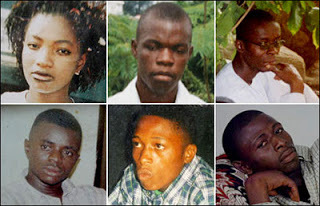 Families of Ifeanyi Ozo, Chinedu Meniru, Isaac Ekene, Paulinus Ogbonna, Anthony Nwokike and Tina Arebun, all between 21 and 25 years old who were brutally murdered in 2005 by policemen as they were returning from a night-out are still wondering if the killers will ever be brought to justice. The trial of Deputy Commissioner of Police, Danjuma Ibrahim; Assistant Superintendent of Police Othman Abdulsalami (still at large) and corporals Nicholas Zacharia, Emmanuel Baba, Emmanuel Acheneje and Sadiq Salami has been on at a Federal Capital Territory High Court presided over by Justice Isaq Bello since 18 January 2006. The trial has suffered many adjournments and followers of the case believe the court seems to be pandering too much to the wiles and subterfuges of the accused policemen to prolong the trial as long as possible in the hope of eventually evading justice. Justice Isaq may not be unaware that all eyes are on him over the many adjournments he has granted which have been responsible for lack of progress in the prosecution of the police officers. “It is very sad that this case is going on like this. Though I know that I have good conscience over this case, we cannot ignore what the people are saying outside. This is not good for the image of the judiciary. I think this is the third time the fifth accused person is changing his lawyer. We cannot continue like this,” he said at one of the hearings early this year while reacting to information by Chief Chris Uche, the prosecution lawyer that Ezekiel Acheneje, the fifth accused person, has no lawyer for his defence and, therefore, the trial has to be adjourned. The lawyer had noted that in a murder trial, an accused person must either be represented or provided with a lawyer. But Acheneje seemed to have perfected a way of “hiring and firing” counsels to stall his trial. The accused has actually changed six counsels since the trial commenced in 2005, including one Olu Otitoju provided to defend him by the Legal Aid Council. He fired Otitoju in January 2011. But some observers of the proceedings have also accused the judge of providing a sort of enabling environment for Acheneje with the bail he granted him in 2006. Normally, accused persons standing trial for offences which carry capital punishment are legally not entitled to bail. But Justice Isaq had based his decision on a claim that Acheneje was suffering from the HIV syndrome and granted him bail, alongside the first accused person, Danjuma in 2006. Danjuma’s lawyer had asked for bail for his client on the excuse that the accused police officer was suffering from diabetes, ulcer and heart problem. Danjuma, who was a television cameraman but got recruited into the Police due to the influence of a former Vice President, had ‘fainted’ twice to convince the judge of his ill-health in court before he was granted bail. Isaq argued that the bail he was granting Danjuma would enable him seek adequate medical treatment. He added that he was allowing Acheneje leave the prison confinement so that he would not afflict other inmates with ailments associated with HIV/AIDS. In granting bail to the two accused person, the trial judge had acknowledged that the provisions of Section 341 and 342 of the Criminal Procedure Code, CPC do not allow bail for an accused person being tried for a capital offence punishable with death. He, however, noted that the issue of ill-health constitute a special and exceptional circumstance for the granting of bail to a person being tried for capital offence punishable with death: “I will not allow sentiment to serve as a control tower in this judicial exercise or anyone at that,” he added. The bails were widely condemned, especially given the fact that one of the principal suspects, Othman Abdulsalam, the Divisional Police Officer of Garki Police Station at the time the crime was committed escaped from the police detention facility and is still on the run. “When Danjuma was released, I forgot everything about the case. The only way justice will be delivered is from God,” Elvis Ozor, a younger brother of one of the deceased, told the British Broadcasting Corporation two years ago. “A murder trial of this nature involving six innocent youths should not linger for four years. This is one case that has exposed the poor administration of the nation’s criminal justice,” Amobi Nzelu, counsel to the slain men also commented two years ago. Chris Uche, a senior advocate who is the prosecution counsel, noted that the trial was moving smoothly and speedily until the defence lawyers introduced the issue of bail. The two accused have since been living as free men and it is, therefore, understandable if Acheneje will do everything possible to delay the trial which may lead to his conviction and confinement to prison. Though this magazine cannot confirm if Danjuma is still on the payroll of the Police as many are speculating, it was confirmed that the accused is living at the posh officers’ housing estate located in Wuse 2, Abuja. Lawyer to the other accused person had in obvious frustrations at the antics of Acheneje had at the resumed hearing of the matter in April asked the judge to try him separately from the others. However, Malam Isa Ibrahim appeared as a lawyer for Acheneje at the resumed hearing of the matter on 17 May. But this also led to another adjournment as the lawyer requested for time to enable him get the record of proceedings and exhibits as he was just coming into the matter. The lawyer also said he needed time to meet with his client. “Once we resume in July, the matter must continue until it reaches its logical conclusion this year. So all counsels in this matter must take note,” Isaq had warned when granting the request of the counsel to Acheneje. Few weeks to the end of 2011, it is doubtful if the promise of ending the case before the end of the year can be fulfilled. In, perhaps, the most sensational extra-judicial killings to come to public knowledge, the country was thrown into agony five years ago as information of how men of the Abuja command of the Nigeria police had, in the early morning of 8 June 2005 ended the hopes and aspirations of the five young men and a lady. The murdered men were later tagged tagged the “Apo Six”, a reference to the area of the FCT where the young men were selling spare parts before they were killed. The sequence of events that led to the unfortunate incident later revealed that Ozor had driven his visiting girlfriend, Augustina and his four other friends to a relaxation spot at Gambiya Street, Area 11, Abuja on the night of 7 June 2005. The policemen claimed that the deceased were robbers who fell to their superior firepower during gun confrontation. They then proceeded to bury the corpses later that morning at a bush in the same Apo district where the murdered men had their shops. However, one of the colleagues of the dead traders who was in the bush to relieve himself at the same time saw the policemen and recognised the bodies they were getting ready to dump in the shallow graves and raised an alarm. The police insisted that the six were robbers, but their colleagues denied. The killings sparked two days riots in Abuja and government was forced to set up a commission of enquiry to investigate the matter. The then Inspector General of Police, Tafa Balogun was forced to set up a special investigation panel headed by Mike Okiro, a retired Inspector-General of Police on the matter. The federal government also in August 2005 set up the Justice Goodluck Olasumbo judicial commission of enquiry with the mandate of examining all issues connected with the killings. During the commission’s sittings, the other five officers accused of the murders currently on trial and eight other police witnesses were emphatic that Danjuma ordered the killings. A Police armourer who appeared before the commission admitted that weapons were planted on bodies just as the Police photographer also confessed that guns were planted on the corpses of the six deceased and pictures taken of them in the grounds of Garki police station to solidify the lies that they were killed during gun battles. According to him, the Police gave him two local pistols, two daggers and one machete to put by the side of the victims, to portray them as armed robbers. The Okiro panel also presented a 31-page report to the judicial commission of enquiry in which it indicted Danjuma and nine other police officers of complicity in the murder. The panel also stated emphatically that the men were not armed robbers as claimed by the police and that the locally-made pistols and other exhibits allegedly recovered from the deceased persons were actually brought out to frame the victims on the instruction of the DCP by the Garki Village station armourer, Inspector Ishaya Nyaiwak. The panel added in the report that the pistol and two unexpended cartridges were used to frame the deceased persons and added that the ammunition were items recovered by the police a week earlier at the Rita Lori Hotel, located at Garki Village, Abuja. The commission, in the course of its sittings ordered the exhumation and post-mortem examination of the bodies of the deceased men to determine the cause of their death and as a further confirmation of the testimonies it has heard from witnesses. The report of the autopsy confirmed that the six victims died of injuries due to “high velocity missile,” consistent with the AK 47 rifle. It asserted that five of the victims were shot to death instantly. The sixth victim and only female among the deceased, according to the commission was killed to ensure that there was no living witness of the atrocities committed by the policemen. The commission, therefore, found the policemen guilty and affirmed that the robbery allegation the indicted policemen had tried to hang on the neck of their victims was false. The Obasanjo administration accepted the commission’s report and issued a draft White Paper on it. Each of the families was paid N3 million as compensation by the government. The police also apologised and provided ambulances for the bodies to be carried to their hometowns for a proper re-burial. “The full weight of the law will be brought to bear on all who are found to have been involved in the perpetration of this heinous crime,” former president, Obasanjo said in August 2005 when commenting on the cold-blooded murder. Over six years after, it appears that promise may never be fulfilled.